Derek Minus is the chief instructor at the Ku-ring-gai dojo, which he established in 1982, on moving to the area. He is an internationally qualified Aikido instructor, ranked 6th Dan by the Aikikai International. He has been practising Aikido for over 35 years and is also qualified to instruct Aiki-ken (sword) and Aiki-jo (staff), holding four weapons teaching certificates awarded by Morihiro Saito Sensei. He is also a NCAS Accredited Level 2 coach. Before beginning Aikido, he trained in Kyokushinkai karate, in which he holds a black belt rank, Taiki-ken, a Japanese derivative of Hsing I-ch’uan and Shindo Muso Ryu Jodo (a classical Japanese staff art). Derek started Aikido practice in 1972 with the late Sugarno Sensei, then the Aikikai representative for Australia. However, it was his present teacher, Saburo Takayasu 7th dan shihan, who introduced him to the powerful Aikido of the Iwama dojo. It was in 1976 when he was a black belt karate holder, that he met Takayasu Sensei, who was able to throw him easily in response to his attack. As in all good martial arts tales, he became Takayasu Sensei’s first Australian student and has continued to study with him to this day. In 1980 he travelled to Japan for an extensive period of study and practice with Takayasu Sensei’s teacher and then headmaster of the Iwama dojo, Morihiro Saito Sensei 9th dan. Professionally, Derek practises as a barrister, mediator and arbitrator and tries to infuse his work as a dispute resolver with the techniques of Aikido he has studied over many years. He also teaches corporate courses on the application of Aikido principles in the resolution of business conflict. 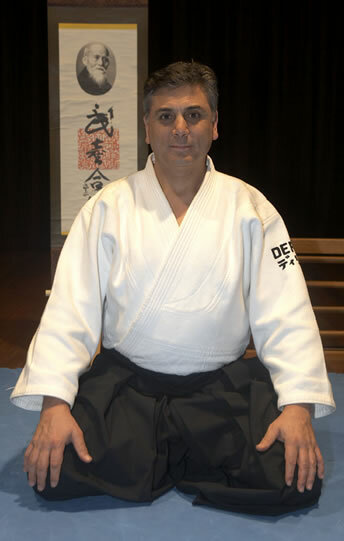 Derek is the Vice-President of the Takemusu Aiki Association Inc. established in Australia to promote Aikido, particularly the technical curriculum entrusted by the Founder, O’Sensei to his longest serving student, Saito Sensei.